Henry Louis Gehrig (June 19, 1903 — June 2, 1941) was a Major League first baseman who played his entire career for the New York Yankees. Gehrig was known as "The Iron Horse" for his durability. Over a 14 year span between 1925 and 1939, he played in 2,130 consecutive games. 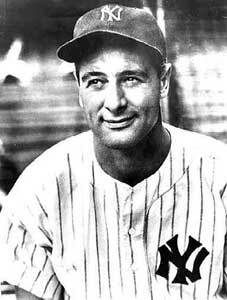 The streak was broken when Gehrig became disabled with the fatal neuromuscular disease amyotrophic lateral sclerosis, or ALS, that later became known as "Lou Gehrig's Disease". Late in his career, x-rays of Gehrig's hands showed that he had suffered 17 distinct fractures - some old, some new. It is a testament to his toughness; considering how battered his hands alone were, it is likely Gehrig's body was in poor shape throughout his career. His streak, once believed to be one of baseball's few unbreakable records, stood until shortstop Cal Ripken Jr. of the Baltimore Orioles played in his 2,131st consecutive game on September 6, 1995. Gehrig was also a phenomenal hitter, accumulating almost 2,000 RBIs in seventeen seasons with a lifetime batting average of .340, lifetime on base percentage of .447, and a lifetime slugging percentage of .632. A 6-time All-Star (the first All-Star game was not until 1933), he won the American League Most Valuable Player award in 1927 and 1936 and was a Triple Crown winner in 1934, leading the American League in batting average, home runs, and RBI. Gehrig was inducted into the Baseball Hall of Fame in 1939. He was the first baseball player to have his number retired. During and after his playing career, Lou Gehrig lived at several locations in the metro New York area. He lived at the Chatsworth Avenue apartments in Larchmont, then moved to 9 Meadow Lane in New Rochelle (adjacent to the College of New Rochelle), and then moved to his final home at 5204 Delafield Avenue in the Riverdale section of the Bronx, which was only a few miles north of Yankee Stadium. Other nicknames given to Gehrig included "Columbia Lou", "Biscut pants" and "Larrupin' Lou". Lou Gehrig was born Heinrich Ludwig Gehrig in New York City, New York, the son of German immigrants Heinrich Gehrig and Christina Fack. His father was unemployed due to epilepsy, so his mother was the breadwinner and disciplinarian. Both parents considered baseball to be a schoolyard game; his mother steered young Lou toward a career in architecture because an uncle in Germany was a financially successful architect. Gehrig attended Columbia University, where he was a member of the Phi Delta Theta fraternity. He could not play intercollegiate baseball for the Lions because he played baseball for a summer professional league during his freshman year. At the time, he was unaware that doing so jeopardized his eligibility to play any collegiate sport. Gehrig was ruled eligible to play on the Lions' football team and was a standout fullback. Gehrig first garnered national attention for his baseball talents while playing in a game at Cubs Park (now Wrigley Field) on June 26, 1920. Gehrig's New York School of Commerce team was playing a team from Chicago's Lane Tech High School. With his team winning 8-6 in the eighth inning, Gehrig hit a grand slam completely out of the ballpark to seal the deal. As Gehrig's baseball exploits became the subject of more and more stories in newspapers, his mother began to see that her son might be able to make money as a baseball player. When both mother (pleural pneumonia) and father (epilepsy) became ill just as Gehrig was deciding whether to sign with the Yankees or stay at Columbia and graduate, he chose the Yankees and used most of his signing bonus to pay off their enormous medical bills. With the rest, he sent them on their very first vacation. Gehrig joined the Yankees midway through the 1923 season and made his debut on June 15, 1923 as a pinch hitter. Over his first two seasons Gehrig saw limited playing time, mostly as a pinch hitter — he played in only 23 games and was not on the Yankees' 1923 World Series roster. In 1925, he batted 437 times for a very respectable .295 batting average with 20 home runs and 68 RBIs. Gehrig's breakout season would come in 1926. He batted .313 with 47 doubles, an American League leading 20 triples, 16 home runs, and 112 RBIs. In the 1926 World Series against the St. Louis Cardinals, Gehrig hit .348 with two doubles and 4 RBI's. Still, the Cardinals won a seven-game Series, winning four games to three. In 1927 Gehrig put up one of the greatest seasons by any batter. That year, Gehrig batted .373, with 218 hits, 52 doubles, 20 triples, 47 home runs, 174 runs batted in, and .774 slugging average. His 117 extra-base hits that season are second all-time to Babe Ruth’s 119 extra base hits and his 447 total bases are third all-time to Babe Ruth's 457 total bases in 1921 and Rogers Hornsby's 450 in 1922. Gehrig's great season helped the 1927 Yankees to a 110-44 record, the AL pennant, and a 4-game sweep over the Pittsburgh Pirates in the World Series. Although the AL recognized his season by naming him league MVP, his season was overshadowed by Babe Ruth’s 60 home run season and the overall dominance of the 1927 Yankees, a team often cited as the greatest team of all-time. Gehrig established himself as a bona fide star in his own right despite playing in the omnipresent shadow of Ruth. Gehrig in fact became one of the greatest run producers in baseball history. He had 6 seasons where he batted .350 or better (with a high of .379 in 1930), 8 seasons with 150 or more RBI's, and 11 seasons with over 100 walks, 8 seasons with 200 or more hits, and 5 seasons with more than 40 home runs. He led the American League in runs scored 4 times, home runs 3 times, and RBIs 5 times; his 184 RBIs in 1931 is still an American League record (and second all-time to Hack Wilson's 191 RBI's in 1930). In September 1933, Gehrig married Eleanor Twitchell, the daughter of Chicago Parks Commissioner Frank Twitchell. On April 23, 1933, Washington Senators pitcher Earl Whitehall beaned Gehrig, knocking him nearly unconscious. Still, Gehrig recovered and was not removed from the game. On July 13, 1934, Gehrig suffered a lumbago seizure and had to be assisted off the field. The next day, he led off the game and was therefore recorded as the shortstop, even though he didn't actually take the field. Gehrig singled and was immediately replaced by a pinch runner to rest his throbbing back. The Yankees were founded as the Baltimore Orioles (the current Orioles franchise operated as the St. Louis Browns from 1902 to 1953). Gehrig's first major league game was against the St. Louis Browns. Babe Ruth was a native of Baltimore. The second base area of the playing field at the Orioles' current home park, Oriole Park at Camden Yards, was the former location of the tavern owned by Babe Ruth's father, George Ruth, Sr.
At the midpoint of the 1938 season, Gehrig's performance began to drastically diminish. At the end of that season, he said, "I tired midseason. I don't know why, but I just couldn't get going again." Eleanor was afraid it was caused by a brain tumor. Gehrig told her that he had been feeling the strength ebb away in his legs since his 30th birthday. Gehrig had also become increasingly clumsy and weak, and would sometimes fall down in the locker room and on the field for no apparent reason. Most reporters and fans believed that it was due to the cumulative effect of injuries and the wear and tear of the streak, of the toll that 14 years of professional baseball had taken on his body. At age 35, however, Gehrig was still a relatively young man and his teammates thought that he had at least a couple of more seasons left in him. His final 1938 stats were well above the league averages: .295 batting average, 114 RBI, 170 hits, .523 slugging average, 758 plate appearances with only 75 strikeouts, and 29 home runs. Babe Ruth's statistics in his final playing years were not much better — and Ruth was not dying. Nevertheless, while Ruth's statistics gradually declined because of age, Gehrig's fell off dramatically from his 1937 season (when he batted .351 and slugged at .643), indicating Gehrig's sudden decline was more than just an off-season or age diminishing his skills. After the season ended, Gehrig felt his strength and coordination slipping away. He went to a specialist in New York for the first time since the beginning of the slump. The specialist's "guess" was that Gehrig had a gall bladder condition. Eleanor did not think this diagnosis made much sense, but Gehrig trusted the specialist. Either way, truth or not, Gehrig set his mind to recovering and remaining reliable for the Yankees. His loyalty was so great that when the Yankees cut his 1939 salary $3,000 from 1938's salary, Gehrig made no attempt to negotiate further. When spring training began in 1939, Gehrig still did not have the strength he used to have. In true Gehrig fashion, he forced himself to train harder, but there was no improvement. His 1939 statistics were the lowest of his career: 8 games, 34 plate appearances, 4 hits, 1 RBI, and a .143 batting average. Even Gehrig's baserunning was affected. Throughout his career, Gehrig was considered a fearsome baserunner, but he had so badly lost control of his muscles by 1939 that even the simple task of running became a liability. I think there's something wrong with him. Physically wrong, I mean. I don't know what it is. But I am satisfied that it goes far beyond his ball-playing. I have seen ballplayers 'go' overnight, as Gehrig seems to have done. But they were simply washed up as ballplayers. It's something deeper than that in this case, though. I have watched him very closely and this is what I have seen: I have seen him time a ball perfectly, swing on it as hard as he can, meet it squarely - and drive a soft, looping fly over the infield. In other words, for some reason that I do not know, his old power isn't there.... he is meeting the ball, time after time, and it isn't going anywhere. Bill Dickey, Gehrig's best friend and road roommate, knew before most that Gehrig was suffering some kind of physical problem. One day Gehrig could not open a bottle of ketchup, and Dickey had to do it for him — a man who could bench press hundreds of pounds could not take the cap off a bottle. Joe McCarthy was facing increasing pressure from Yankee management to switch Gehrig to a part-time role, but he could not bring himself to do it. Things came to a head when Gehrig had to struggle to make a routine put-out at first base. The pitcher, Johnny Murphy, had to wait for Gehrig to drag himself over to the bag so he could catch Murphy's throw. Murphy said, "Nice play, Lou." That was the thing Gehrig dreaded — his teammates felt they had to congratulate him on simple chores like put-outs, like older brothers patting their little brother on the head. On April 30, Gehrig went hitless against the weak Washington Senators. Gehrig had just played his 2,130th consecutive major league game. On May 2, the next game after a day off, Gehrig approached McCarthy before the game and said, "I'm benching myself, Joe." McCarthy acquiesced and put Ellsworth "Babe" Dahlgren in at first base, and also said that whenever Gehrig wanted to play again, the position was his. Gehrig himself took the lineup card out to the shocked umpires before the game, ending the amazing 14-year stamina streak. Before the game began, the stadium announcer told the fans, "Ladies and gentlemen, this is the first time Lou Gehrig's name will not appear on the Yankee lineup in 2,130 consecutive games." The Detroit fans gave Gehrig a standing ovation while he sat on the bench with tears in his eyes. Gehrig stayed with the team, but his condition had rapidly deteriorated. By mid-June, his wife feared he had a brain tumor. A friend advised Eleanor to call Mayo Clinic in Rochester, Minnesota. Her call was immediately transferred to Dr. Charles Mayo, who had been following Gehrig's career and his mysterious loss of strength. Dr. Mayo told Eleanor to bring Gehrig as soon as possible. She agreed to convince Gehrig to go on one condition: that she be the first and only person given his full prognosis. Dr. Mayo hesitated, saying that policy was to only give full disclosure to the head of the household. Eleanor told him that she was the one who controlled the household finances, so she was the only head of the household. Eleanor quickly arranged for Gehrig to fly to Rochester from Chicago, where the Yankees were at the time, and he arrived at Mayo Clinic on June 13, 1939. The first doctor to meet with Gehrig, Dr. Harold C. Habein, did not even have to touch him. Dr. Habein took one look at Gehrig's walk and knew what was wrong from his gait and posture — it was the same disease that had killed Dr. Habein's own mother just months before, amyotrophic lateral sclerosis. Dr. Habein clearly remembered the distorted facial expression and shuffling walk of his mother, and Gehrig was showing the same symptoms. Gehrig stayed at Mayo Clinic for the next six days, and on June 19, Gehrig's 36th birthday, the diagnosis was confirmed. Eleanor later claimed that the Mayo Clinic called her before telling Gehrig himself, but "Luckiest Man: The Life and Death of Lou Gehrig," Jonathan Eig's biography of Gehrig, sheds doubt on Eleanor's claim. In all likelihood, Gehrig got the full prognosis: expect rapid paralysis, increasing trouble swallowing and speaking, no loss of mental ability, and a life expectancy of less than three years. Gehrig was probably told that the cause of ALS was unknown but it was painless, non-contagious and cruel — the nervous system was destroyed but the mind was intact. Victims are completely aware of their surroundings and of their physical wasting. Gehrig was greeted by a group of Boy Scouts at the train station in Washington, where he caught up with the Yankees after his Mayo Clinic visit. The boys happily waved and wished him luck with the series. Gehrig waved back, but leaned forward to his companion, a reporter, and said, "They're wishing me luck - and I'm dying." On June 21, the Yankees announced that Gehrig was retiring due to his illness, but would remain with the team as a captain. Babe Ruth with Lou Gehrig, on Lou Gehrig day (July 4, 1939). The New York Yankees celebrated "Lou Gehrig Day" on July 4, 1939, between games of a holiday doubleheader against the Washington Senators. Dozens of people, including many from other major league teams, came forward to give Gehrig gifts and to shower praise on the dying slugger. The 1927 World Championship banner, from Gehrig's first World Series win, was raised on the flagpole, and the members of that championship team, known as "Murderer's Row", attended the ceremonies. New York Mayor Fiorello LaGuardia and the Postmaster General were among the notable speakers, as was Babe Ruth. During the twilight of Ruth's career, which coincided with Gehrig's rise, Ruth made snide remarks about the streak, saying that Gehrig needed to either sit on the bench or go fishing (a passion shared by both men). In his speech that day, Ruth suggested again that Gehrig go fishing, but it was an encouragement this day instead of a wisecrack. Joe McCarthy, whose relationship with Gehrig was almost a father-son bond, was apprehensive about speaking, because he knew if he started crying it would make it harder for Gehrig to get through the ceremony. After describing Gehrig as "the finest example of a ballplayer, sportsman, and citizen that baseball has ever known," McCarthy could stand it no longer. Turning tearfully to Gehrig, the manager said, "Lou, what else can I say except that it was a sad day in the life of everybody who knew you when you came into my hotel room that day in Detroit and told me you were quitting as a ballplayer because you felt yourself a hindrance to the team. My God, man, you were never that." The Yankees retired Gehrig's uniform number 4, making him the first player in history to be afforded that honor. Gehrig was given many gifts, commemorative plaques, and trophies. Some came from VIPs; others came from the stadium's groundskeepers and janitorial staff. The Yankees gave him a silver trophy with their signatures engraved on it. Inscribed on the front was a special poem written by New York Times writer John Kieran. The trophy cost only about $5, but it became one of Gehrig's most prized possessions (). Fans, for the past two weeks you have been reading about a bad break I got. Yet today, I consider myself the luckiest man on the face of the earth. I have been to ballparks for seventeen years and I have never received anything but kindness and encouragement from you fans. Look at these grand men. Which of you wouldn’t consider it the highlight of his career just to associate with them for even one day? Sure I’m lucky. Who wouldn’t have considered it an honor to have known Jacob Ruppert? Also, the builder of baseball’s greatest empire, Ed Barrow? To have spent six years with that wonderful little fellow, Miller Huggins? Then to have spent the next nine years with that outstanding leader, that smart student of psychology, the best manager in baseball today, Joe McCarthy? Sure, I'm lucky. When the New York Giants, a team you would give your right arm to beat and vice versa, sends you a gift, that’s something. When everybody down to the groundskeepers and those boys in the white coats remember you with trophies, that’s something. When you have a father and mother who work all their lives so that you can have an education and build your body, it's a blessing. When you have a wife who has been a tower of strength and shown more courage than you dreamed existed, that's the finest I know. So I close by saying that I might have been given a bad break, but I've got an awful lot to live for. Thank you. The crowd stood and applauded for almost two minutes. Gehrig was visibly shaken as he stepped away from the microphone, and wiped the tears away from his face with his handkerchief. Babe Ruth came over and hugged him. Gehrig left the field, and did not calm down until he was home with Eleanor. After Gehrig's retirement, Yankee executive Ed Barrow promised Gehrig that he and Eleanor would never have to do without money. By baseball rules at the time, Gehrig had the right to stay on the Yankee payroll until the end of the season because he had retired voluntarily (meaning his exit was not instigated by the Yankees or a baseball-related injury). This provision also meant that Gehrig would remain the property of the Yankees, the club with whom he last played. Gehrig attended some Yankee home games in 1939, although his ALS soon made it impossible for him to climb stairs. The Baseball Writers Association of America decided to waive the mandatory one-year waiting period for election to the National Baseball Hall of Fame for Gehrig. The group held a special vote during the 1939 winter meetings in Cincinnati, Ohio, electing Gehrig to the Hall of Fame on December 7, 1939, aged 36 and 5+ months. Even though Gehrig was the youngest member (at that time) ever elected, he was too ill to attend his induction ceremony. When Gehrig was diagnosed, Mayo Clinic doctors had suggested he would fit well in an office-type position with the Yankees. By the end of the 1939 season, however, Barrow made it clear to Eleanor that "it was about time for him (Gehrig) to get himself another job." Both Gehrigs were upset - Lou was angry that a man for whom he had tremendous respect would speak that way to Eleanor, and Eleanor was bitter that a loyal Yankee like her husband would be pushed out so quickly. Eleanor maintained throughout her life that she never told Gehrig that ALS was fatal. But 200 pages of Gehrig's personal letters, recently discovered, suggest that the Yankee hero knew exactly what was happening to him. He was writing to and meeting with doctors throughout his illness, and subjecting himself to all sorts of experimental cures. "Don't think I am depressed or pessimistic about my condition at present," he wrote, according to the book "Luckiest Man." I intend to hold on as long as possible and then if the inevitable comes, I will accept it philosophically and hope for the best. That's all we can do." In October 1939, New York Mayor Fiorello LaGuardia offered Gehrig a position as one of the city's three parole commissioners, and Gehrig accepted. LaGuardia was very happy with Gehrig's job performance. Gehrig worked with many poor and struggling people of all races, religions, and ages, some of whom would complain that they just "got a bad break." Gehrig never scolded them or preached about what a "bad break" really was. He visited New York City's correctional facilities, but insisted that they not be covered by news media. To avoid any appearance of self-praise, Gehrig made sure his listing on letterhead, directories, and publications read "Henry L. Gehrig" (). Gehrig went regularly to his office until about a month before his death, when it was clear his legs were unable to carry him anymore and his doctors told him to stop trying to walk. Gehrig refused a wheelchair, even when it was clear it was his only option for mobility. Gehrig was soon completely bedridden, and his condition rapidly deteriorated after that. On June 2, 1941 at 10:10 p.m., 16 years to the day after he replaced Wally Pipp at first base, Henry Louis Gehrig died at his home at 5204 Delafield Avenue in The Bronx neighborhood of Riverdale. He was 37 years old. News was immediately dispatched to Babe Ruth and his wife Claire, who lived on Riverside Drive on the upper west side of Manhattan. The Ruths immediately went to Riverdale to console Eleanor Gehrig. Lou Gehrig was waked in Riverdale during a pouring rain, and services were held at the Christ Episcopal Church of Riverdale. The white house in which he lived stands to this day adjacent to the east side of the Henry Hudson Parkway and has a plaque stating that the house was occupied by Lou Gehrig. Mayor LaGuardia ordered flags to be flown at half-staff the day after Gehrig's death. On June 4, his body was cremated and interred at Kensico Cemetery in Valhalla, New York. In an ironic coincidence, Lou Gehrig and Ed Barrow are both interred in the same section of Kensico Cemetery, which is next door to Gate of Heaven Cemetery, where Babe Ruth and Billy Martin are interred. The scheduled Yankee game for June 4 was postponed due to rain. There is an interesting twist to the final resting place of Lou Gehrig. Although he was born in 1903, his headstone lists 1905 as his year of birth. This error has gone uncorrected for the last 64 years. Kensico Cemetery is aware of the mishap, but Gehrig's family never authorized the cemetery to change his year of birth from 1905 to 1903 on the grave marker. The cemetery cannot legally make the correction without a court order, and the year 1905 is likely to remain on the headstone ad infinitum. It is unknown why Gehrig's family never authorized Kensico Cemetery to make the correction. Eleanor Gehrig never remarried following Lou's death, and she joined him 43 years later on March 6, 1984, which was her birthday. The Yankees dedicated a monument to Gehrig on July 6, 1941. It calls him "A man, a gentleman and a great ballplayer whose amazing record of 2,130 consecutive games should stand for all time." The monument gives the date of its dedication as "July the Fourth 1941", but that day was a rainout and the Yankees decided to dedicate the monument during a doubleheader the next Sunday, July 6. Gehrig's was the second monument to be placed in front of the center field flagpole in Yankee Stadium, following the one to Miller Huggins in 1932. The monument to Babe Ruth was dedicated in 1949, and the three stood in front of the flagpole until the stadium closed for renovations in 1973. Upon its reopening, the three monuments (Gehrig's on the left, Huggins' in the center, Ruth's on the right) were placed in front of a new flagpole, at the top of which rests an actual bat used by Gehrig, now bronzed, in the stadium's Monument Park, where they still rest today. Ranked #6 on The Sporting News' list of the 100 Greatest Baseball Players, chosen in 1999. July 4, 1939 farewell speech is voted by fans as the fifth greatest moment in Major League Baseball history in 2002. The number one moment is Cal Ripken, Jr. breaking Lou Gehrig's consecutive games played record.